It might be the best small SUV on the market. The RAV4 specializes in reliability. The Mazda CX-5 is all about luxury, handling, and reliability. 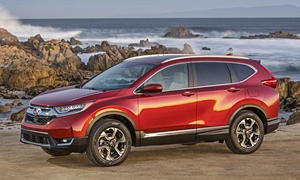 The CR-V is a great all around package. The 2017 had some first-year issues, but 2018 looks to be better. I don't own one. Our 2017 CR-V AWD Touring replaced a 2015 AWD CR-V that was totaled in July 2016 accident (no injuries, fortunately - Honda's ACE isn't just hype, it REALLY works). Because we owned the last gen, also a Touring AWD with the 2.4l engine and, now, the current generation with the 1.5l turbo, so I'll do a brief comparison of the two. First, and most importantly - the 2017 CR-V has been absolutely troublefree for 16700 miles; absolutely no problems, rattles, squeeks, just 2 normal oil/filter services. Engine: The 1.5l turbo, though just slightly more powerful than the 2.4l, is significantly more powerful, thanks to a much lower peak torque RPM. This really makes a difference, especially off idle and when passing at speed. I've also towed a trailer at just about the maximum tow rating of 1750 pounds several times up into the Sierra foothills with no performance issues. Transmission: I'm still not a big fan of CVTs, but the CR-V transmission is probably the best of its type. It rarely drones and is generally unobtrusive. I have noticed very occassional "interesting" behavior when slowing almost to a stop and then accellerating. It's similar to the jerkiness that occurs with a conventional transmission when they get "caught" between gears but it happens so rarely that it's not a big concern. Handling: A bit bettet than the last gen. I can't call handling "sporty" but it is solid, predictable and confidence-inspiring. Steering weight and feel is much improved over the 2015. Interior & Infotainment: I've read reviews that say the interior doesn't have the look and feel of a vehicle of around $35000 (for the touring model) but, it's so much better than the 2015 interior that there's really no comparison. The ivory and black intetior looks and feels great and front and back seats are comfortable on long drives. Android auto works so well (w/Samsung S8) that I rarely use Honda's navigation or voice recognition systems. That said, the display is responsive and most features are easiiy accessed but Honda's voice recognition system really needs work. Honda Sensing: Honda's suite of driver assistance systems works well and is so much better than that in the 2015 that it's hard to believe there's only 2 years between the systems. Adaptive cruise control now takes the car from speed down to a dead stop, starting up again with a tap of the accelerator or steering wheel control. It makes SoCal's traffic miserable traffic almost fun, or at least tolerable. Emergency braking is more effective and less intrusive. Lane centering is better, too, but still not really ready for prime time. Complaints: Not many, really. The Hankook tires are a perplexing combination of poor traction in dry, wet, and on gravel and they're not even all that quiet. Perhaps Hankook pays Honda for their use? The engine sound is odd - it sounds constricted, like the engine exhaust is pushing past a restriction. It is less noticeable now than when the car was new... or perhaps I'm just getting used to it! And, as noted earlier. Honda's voice recognition system is not all that accurate and takes too many vommands to pergorm basic functions. Too bad Android Auto can't control vehicle systems because it's a far superior interface.